Do you like Music? So, I suppose you know Rollings Stones. One of my favourite songs is Time is on my side, a version from an original one, written by Jerry Ragovoy. 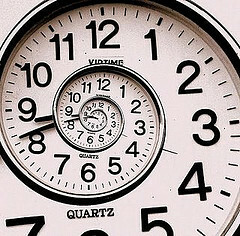 El tiempo está de mi lado, but not all our students on www.spanishviaskype.com think the same. When they have to translate the word “time” in Spanish, they don’t think it’s on their side. How should I translate “time”? Tiempo, vez, momento, hora…? Today, we’ll learn some common expressions and slangs with the word time and we’ll try to clarify this problem. Tiempo: Perhaps this is the first word that comes to mind. Tiempo is a general word that means “the length of things”. But also “the weather”. El tiempo es oro (Time is money), No tengo tiempo (I don’t have time), ¿Qué tiempo hace en España? (What’s the weather like in Spain? ), En aquel tiempo, se hablaba latín en España (at that time, Latin was spoken in Spain). Vez: Remember: this is a feminine word! Vez is the alternation of things in a specific order or turn or the repetition of actions. Había una vez… (Once upon a time…), tres veces a la semana (three times a week), esta vez no (not this time). Hora: This word means 60 seconds of time but also the specific time to do something. ¿Qué hora es?… (What time is it? ), Hoy he trabajado ocho horas (I’ve worked for eight hours today), Es hora de cenar (It’s dinner time), Es hora de irse (It’s time to go). Momento: It’s a portion of time, very brief in relation to other. En este momento, no puedo ayudarte (At the time, I can’t help you), Lo siento, este no es el momento (I’m sorry, this is not the time). So, what are you waiting for? Es hora de reservar a free trial class here, and learn Spanish via Skype. Time is on my side by Rolling Stones.